Beautiful sandstone formation with a huge amphitheater and large window. Take Highway 191 south of Moab for ~23-25 miles (<1 mile past La Sal Junction). You are looking for a gravel road on your right (west) signed as LOOKING GLASS ROAD (used to be called Hatch Wash road). Turn right and travel west 1.4 miles. Option 1: (May not be passable depending on recent rains) Turn left onto a deep sand 'road' for 0.3 miles. Before a ranch fence, turn right and follow the 'road' to the base of Looking Glass. 10 second approach. Option 2: Continue on the road and take a left just after passing Looking Glass rock. Park at the side of the road. Hiking back from the descent. Good anchors at final rap station. On 11/1/13 the first dirt road to the start of the "Regular Route" (aka "East Rib") was passable for high clearance 4x4, but not regular cars. 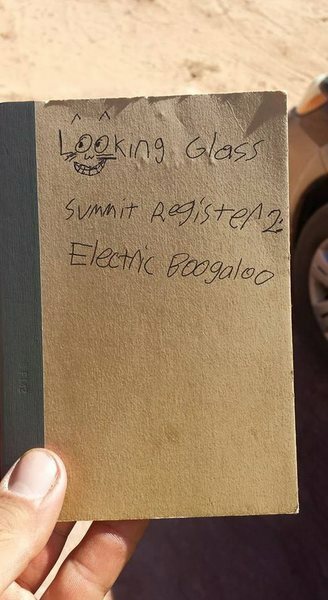 After I left Moab a few years ago, Isaac Dority, Jarod Yazzie, Alex Pina and I put a small register on the summit of Looking Glass. A few months ago, I heard that it disappeared, which was a real bummer--there were entries in there by people who aren't with us anymore, which isn't something you can really replace. This past weekend, my partner Chris Thai and I added a new register on our way back from the Creek. It's right next to the summit cairn. There's a small notebook and a pen in there to start. I assume some jack-off took the first one for no reason, but climbers, if I'm wrong and you or someone you know is unhappy about the register, please, call me at 7206758129, and we'll talk it out and see if we can come to a compromise. The old one saw a lot of use and was tastefully out of sight, so it would be a shame to see this one take a walk too. You can use a single 70 meter DYNAMIC rope. At first glance the rope will be dangling 3-4 feet off the bottom, however with rope stretch we had about six or more feet to go. A static 70 meter will not work - Neither will a dynamic 60 meter. Hope this helps and happy rapping. Oh, and beware of rattle snake - Saw two to the left of the first belay spot. Attempted Looking Glass on May 3. Saw about seven rattle snakes at the base of the route. One was literally on first step of the route. There is a harder, crumbly, and sketchy unprotected alternative start to the right around the toe. There were also snakes on that side, though.